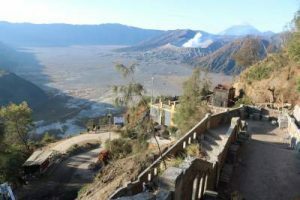 The distance of Probolinggo port with Mount Bromo national park is only about 70 km or estimated travel time from 1 to 1.5 hours. Mount Bromo is the best destination in East Java, especially the Pobolinggo area. Arrived at Probolinggo Seaport, meeting services with our guide and departed for Bromo – Tengger National Park area from about 1 hour drive. On the way, stop at Madakaripura Waterfall (optional tour), which becomes one of waterfall close to mount bromo from Probolinggo. Arrive in Bromo, directly suttle to 4WD jeep then continues to bromo crater, pura luhur poten (hindus tengger temple) etc. Finished bromo half day tour from probolinggo and then return to dock of cruise ship probolinggo harbor. The tour ended. Mount Bromo is an active volcano and part of Tengger Massif, in East Java, Indonesia. At 7,641 feet, Bromo is not the highest peak in the range, but most famous of all. The massive area is one of the most visited tourist attractions in Probolinggo – East Java – Indonesia. Attention Tour to Mount Bromo? The minimum age to participate in this tour is 3-7 years and the maximum age is 65 years. Minimum height of 1.25m and maximum weight of 80kg applies. Horses in Bromo are used as transportation and hence are led by their owners – this is not a horse riding excursion. Mt. Bromo is a volcano and if it shows volcanic activity, the itinerary can change according to local conditions. To make your trip to Bromo as comfortable as possible, please wear comfortable flat-soled shoes, clothing that suits the weather conditions. Thank you for reading our information about the quote cost of a Bromo Tour Package, special offer for cruise ship passengers anchored in Probolinggo Port, now please contact us to get a bromo tour package from probolinggo cruise ship port at an resoinable price.